Christ The Bridegroom: Registration now available for the Bridegroom's Banquet! 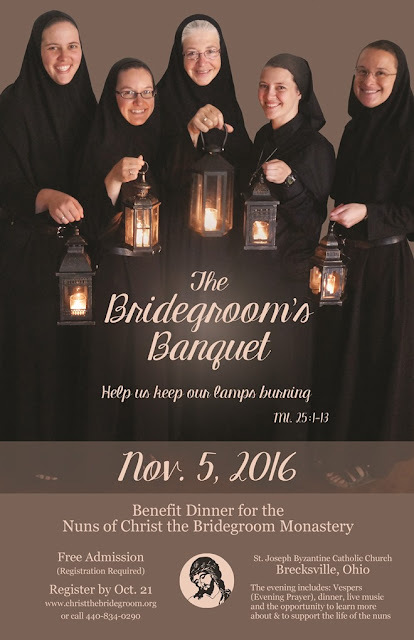 Registration now available for the Bridegroom's Banquet! There is no cost to attend the dinner, but registration is required (by October 21). Adults 21 and older may attend. Enjoy a buffet dinner, live music and an evening with the nuns and their guests. Learn more about the nuns and their life of prayer and hospitality. The evening will begin with Vespers (Evening Prayer) at 5:30 p.m. and conclude at 8:00 p.m. You are also invited to attend the parish’s Vigil Divine Liturgy at 4:00 p.m.
For the schedule, more information and to register, please click here to visit the Bridegroom's Banquet tab. We hope to enjoy the evening with you on November 5!